Frank and his wife, Melody, have lived in the Western New York area their entire lives. After Frank retired from Xerox, they decided to head south to guide during the winter months. Now, when the maple leaves turn color, they leave for Central Florida at the end of October and stay through April, fishing and guiding for trophy bass. Frank has fished the Bassmaster’s Tournament Trail, while Melody has fished the now defunct Bass’n Gal Tournament Trail. Together, they fished the NYS B.A.S.S. Chapter Federation Trail. From the northern tip of Lake Champlain, throughout the Midwest and South, they’ve gained vast experience fishing these different types of water; river impoundments, rivers, reservoirs, tidal waters and natural lakes. Frank and Melody are licensed USCG Captains and licensed NYS Hunting and Fishing Guides. They are required to carry a Joint Pilot and Engineer License for the inland waters of New York and the USCG Captain License for waters connected to the ocean. All of their vessels are inspected annually by the NYS Department of Parks for safety equipment and sea worthiness. 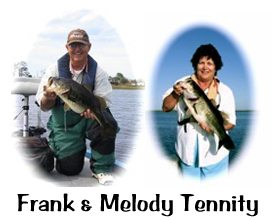 Frank and Melody are located close to the Kissimmee Chain of Lakes, less than an hour south of Disney, seventy minutes southeast of Busch Gardens and twenty minutes east of Legoland (formerly known as Cypress Gardens). This Kissimmee Chain includes Lakes Toho, Cypress, Hatchineha, and Kissimmee. Other lakes they fish are Pierce, Marion, Crooked, Arbuckle, and Walk-in-the-Water, along with the Winter Haven Chain, Butler Chain and several smaller lakes in the vicinity. Rather than watching the lakes freeze and the snow fall, pack your bags and head off to the Sunshine State. While you’re there, treat your kids with a visit to Disney and reward yourself with a well earned bass fishing trip. 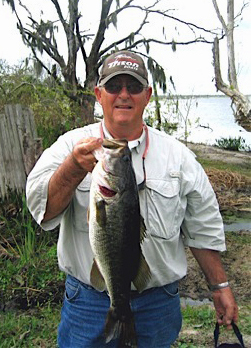 Central Florida is the ideal location to pursue a trophy largemouth bass.